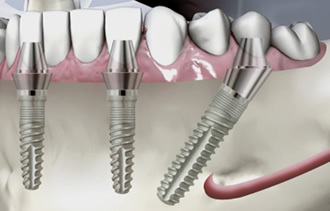 Dental implants are small titanium screws that replace the roots of missing teeth. Our bodies do not recognise Titanium as foreign, allowing bone to grow intimately around the implant making it permanently fixed and strong - unlike dentures and bridges that can move around and cause damage to other teeth and gums. If you have missing teeth, or are currently wearing dentures, dental implants are considered the best way of offering a long-term, fixed solution. 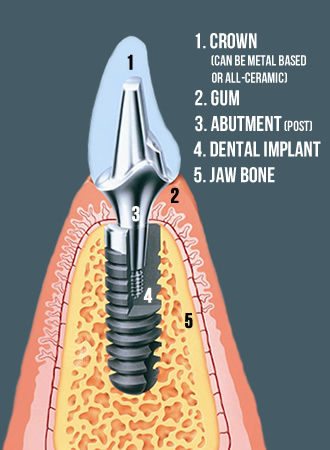 Dental implants can be used to replace one tooth, several teeth, or an entire set depending on your needs and wishes. Your resulting implant teeth will be attractive, securely fixed replacement teeth which look, feel and function like natural teeth. You can read about other patients' great experiences here. Invest from £2500. Having missing teeth can greatly impact on your lifestyle and the World Health Organisation consider having a denture a disability. People who are missing teeth tend to suffer health issues, have lower self-confidence, and are often less active. When a tooth is removed the surrounding bone and gum shrinks as it heals and will continue to shrink as time goes by. This bone loss can, in turn cause other problems with appearance and health. Dental implants stimulate the jaw bone and prevent it from shrinking further and can last a lifetime. Tooth supported bridges and dentures do not prevent bone loss. In fact, ill-fitting dentures can accelerate bone loss to the extent that a denture can no longer be tolerated. Dental implants are the only tooth replacement solution that protects your dental health by simulating a natural tooth. Life changing. Dental implants can restore an active, healthy lifestyle. You can give business presentations, swim, ski or participate in any sport and eat your choice of food without worrying about teeth moving or falling out. Improved appearance. Dental implants look and feel like natural teeth. Implants are anchored into your jaw so they can last a lifetime. Improved speech. Poorly fitting dentures can move in your mouth causing you to mumble or slur your words. 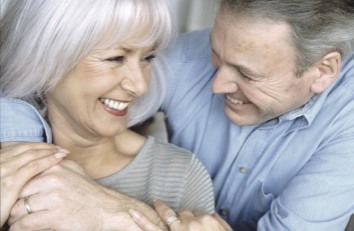 Dental implants allow you to speak without the worry that your dentures might slip. Improved comfort. Dental implants are fixed in place and function almost like natural teeth so they eliminate the discomfort caused by removable dentures. Improved eating. Dentures that move can make chewing difficult and painful. Dental implants function like your own teeth, allowing you to eat your favourite foods with confidence and without pain or discomfort. Improved self-esteem. Not having to worry about uncomfortable or loose dentures will allow you to smile confidently and help you feel better about yourself. Improved oral health. Dental implants don't require grinding down of adjacent healthy teeth, as with a traditional, tooth-supported bridge. Your own teeth are left undisturbed, improving your long-term oral health. Improved durability. Dental implants will last longer than any other form of dentistry. With proper care, implants can last a lifetime. Improved convenience. Removable dentures can be uncomfortable, inconvenient and embarrassing. They are a nuisance to clean (particularly when eating out) and often require the use of messy fixative to keep them from moving in your mouth. Dental implants are fixed in place and provide a solution as close to natural teeth as possible.